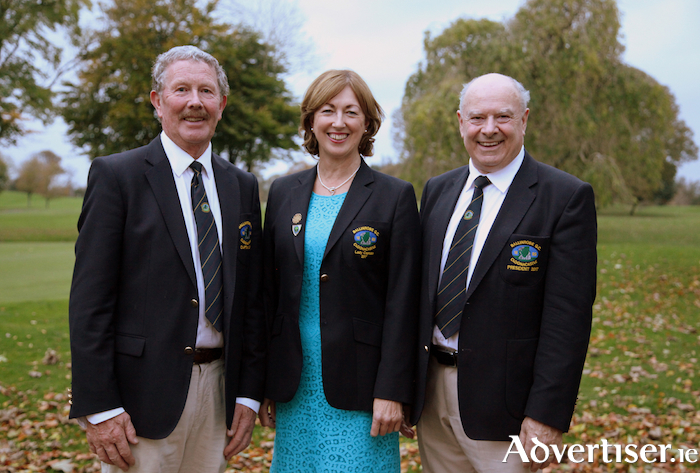 At Ballinrobe Golf Club pictured are Club Captain Joe Cradock, Lady Captain Mary Colleran and Club President John Staunton , at the final presentation evening of the year at the Club: Photo: Trish Forde. It was another busy weekend around the courses of the county and this weekend promises another busy weekend as the Winter season kicks into gear. Mick Mellett was the winner of the gents' stableford competition with a score of 34pts, he finished one point in front of second placed Don Dillon who came home with a score of 33pts - it was equally tight between second and third placed finishers, with Martin Moylette finishing just one point behind Dillon in third place. In the ladies' competition Mary B O'Donnell was the winner with a score of 34pts, she finished one point in front of both Julie Loftus and Margaret Walsh, with Loftus taking second place thanks to her back six scoring. The midweek Winter morning scramble was won by the team of James Waldron, Ronan Mahon and Gus Heraty with a score of 50 nett, they finished two strokes in front of the trio of Geraldine O'Malley, Derek Reilly and Mick Mellett - while third place went to Mary B Prendergast, Mary Conlon and Margaret Forkan. The clubs AGM takes place on Monday, November 20 at 8pm in the clubhouse. In last weekends gents' competition Shane Ganley was the winner with a score of 42pts, he finished one point in front of Stephen Hunt in second place on 41pts, the same score as third placed Willie Coyne with Hunt finishing in front thanks to his back nine play. The ladies' competition was claimed by Margaret Dyer with a score of 35pts, she finished one point in front of second placed Chris Keane - while Anne Hussey came home in third pace on 33pts. In the clubs weekend competition, Pat Waldron was the winner with a score of 38pts, he finished three points in front of Henry Horkan in second place with Michael Howley another point behind in third spot. In the third round of the Winter League, the winners were Frank Murray's team with 101pts - the team consisted of Frank Murray, Ian Brennan, Tom Moylett and Declan Prendergast. The nearest the pin challenge was won by Jimmy Kissane on the 12th hole. Tonragee’s Colin Cooney was installed as Captain of Mulranny Golf Club for 2018 at a well attended Annual General Meeting on Friday last. Colin succeeds Polranny’s John McNamara and he is expected to be a very hands on Captain and together with Lady Captain, Westport native, Nuala Hopkins, members can look forward to strong leadership in the coming year. Colin was Junior Convenor in 2017 and he fronted a very progressive youth programme. Colin paid tribute to his good friend and outgoing captain, John, for his popularity and hard work, during his year in office and in particular for his assistance to Greenkeeper, Pat. John expressed his delight on how the year developed and stated that he only experienced positivity with the highlight being the capture of the Grainne Uaile title after a lapse of ten years. He complimented and thanked the officers and committee for their support and dedication. A full list of officers and committee will appear after the first committee meeting.